Famed architect John Portmans soaring atria and cloud-grazing glass elevators grace skyscrapers around the world, but no city better embodies his postmodern aesthetic than his hometown of Atlanta. Portman shaped the citys skyline throughout the 1960s, 70s and 80s, and today, the architect has reimagined one of his original designs 230 Peachtree Center to include the new Hotel Indigo Atlanta Downtown. From the curved, glass-and-steel staircase that greets you in the lobby to our sleek guest rooms, nods to Portmans midcentury design merge seamlessly with the latest technology and amenities. Easy access to downtowns biggest draws including AmericasMart, another Portman work, accessible via skywalk make our location perfect for business and leisure travelers alike. After a day on the town, settle in for a cocktail at our circular bar, where a floating glass-and-steel canopy mirrors our grand staircase, or enjoy dinner at JP Atlanta. Inside and out, youll feel Atlantas design history come to life. This corner meeting room is 575 square feet and is located on the 2nd floor. This meeting room has a 60 LCD TV, speaker system, and AV and data connections. This corner meeting room is 600 square feet and is located on the 2nd floor. This meeting room has a 60 LCD TV, speaker system, and AV and data connections. 100A is located on the first floor of AmericasMart, which is located next door to the Hotel Indigo Atlanta Downtown and offers connecting doors between the two buildings. 100B is located on the first floor of AmericasMart, which is located next door to the Hotel Indigo Atlanta Downtown and offers connecting doors between the two buildings. 100C is located on the first floor of AmericasMart, which is located next door to the Hotel Indigo Atlanta Downtown and offers connecting doors between the two buildings. 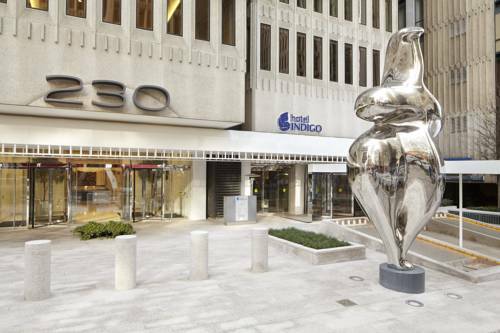 100D is located on the first floor of AmericasMart, which is located next door to the Hotel Indigo Atlanta Downtown and offers connecting doors between the two buildings. 100E is located on the first floor of AmericasMart, which is located next door to the Hotel Indigo Atlanta Downtown and offers connecting doors between the two buildings. 100F is located on the first floor of AmericasMart, which is located next door to the Hotel Indigo Atlanta Downtown and offers connecting doors between the two buildings. 100G is located on the first floor of AmericasMart, which is located next door to the Hotel Indigo Atlanta Downtown and offers connecting doors between the two buildings. Candler Park Golf Course is located just 3.6 miles from our hotel. It is a 9 hole executive course located in Candler Park, near Virginia Highlands. Bobby Jones Golf Course is located just minutes from Downtown Atlanta. The 5,888 yard course intertwines with Peachtree Battle Creek. Course is a Par 70 championship course. AmericasMart Atlanta is the nation's #1 product destination. AmericasMart Atlanta connects buyers with top brands from around the world. AmericasMart is located next door to the Hotel Indigo Atlanta Downtown. Experience Southern charm at the Hard Rock Cafe Atlanta! Located just steps from the Hotel Indigo Atlanta Downtown, the Hard Rock Cafe Atlanta is a must-do for the music lover in you!